We’re on the brink of a historic period for cities around the world. By 2050, the population in cities will double, intensifying existing socioeconomic, public health and environmental problems. At the same time, innovations in technology can be used to design communities that are more efficient, responsive and resilient. 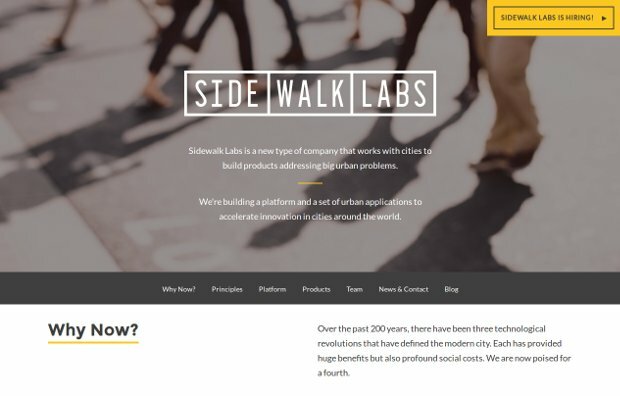 Sidewalk Labs aims to foster the development of technology products, platforms and infrastructure that help improve life in cities around the world. The mission of this project is to improve life in cities for everyone through the application of technology to solve urban problems. Dan Doctoroff, the former CEO of Bloomberg LP and Deputy Mayor of Economic Development and Rebuilding for the City of New York, and Google today announced the formation of Sidewalk Labs, as an urban innovation company that will develop technology at the intersection of the physical and digital worlds, with a focus on improving city life for residents, businesses and governments. The announcement of Sidewalk Labs comes as the world is continuing a massive urban shift. At the same time, new technologies – including ubiquitous connectivity and sharing, the internet of things, dynamic resource management and flexible buildings and infrastructure – are emerging to allow cities and citizens to tackle problems in real time. Sidewalk Labs’s mission will develop new products, platforms and partnerships to make progress in all these areas.